Because of the file size of the ransom note, we have presented it in two sections. The first part is shown here, and a link below the image will take you to the second section. Following the ransom note, read Bart's analysis and then see what other analysts say about it. This note raised more questions than we had before the note. When we, as document examiners, compare this writing with the known writing of the mother, we come up empty. There doesn't seem to be a match... which explains why, after taking five samples of writing, the experts in Colorado also didn't get a match. We don't have enough handwriting of the father, John Ramsey, to rule him out as the author of the note. 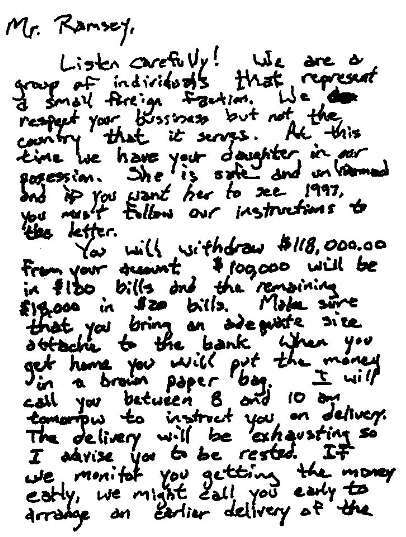 But, it strikes me as peculiar that the ransom note is so long and doesn't appear to be in a "fake" handwriting, which one would suspect of someone doing if they were trying to "cover up" a crime or put the police on a wild goose chase. Although the note starts out as nervous and shaky, it levels out throughout and appears to have similar characteristics until the end. In a nutshell, the identity of the author of the note cannot be clearly determined without more handwriting samples from other suspects. My number one suspect... still... is John Ramsey. What's your guess? Another interesting interpretation from Donald Pugh, Certified Handwriting Analyst, a graduate of HandwritingU.com. 51 Easy-to-use instructional flash cards with separate personality traits illustrated on each card. Fun, simple, accurate and portable. This is Bart Baggett’s all time best seller! 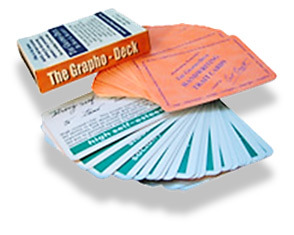 Each deck of cards comes with a 40+ page instruction manual as a special bonus! This is a perfect companion to the Change Your Life Workbooks or the Success Secrets of the Rich and Happy.